June has finally busted out all over, and there are some great tropical happenings coming up on both ends of the mainland. Next week we'll be in FLORIDA for HUKILAU (June 12-15) - the world's biggest and best annual Tiki event - and this year will be the last one! We wouldn't think of missing it! Lots of great entertainment this year with Charles Phoenix, Beachbum Berry, live bands, and an historical tour of America's most incredible Polynesian restaurant, the Mai Kai in Fort Lauderdale. 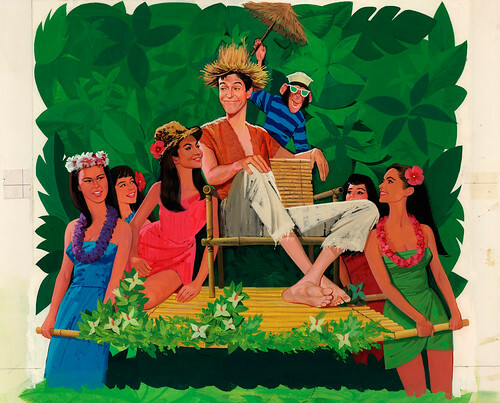 I will be hosting a special "Tiki TV" presentation on Saturday the 14th. One week later (Sunday June 22), Jody and I will be at DISNEYLAND for the ENCHANTED TIKI ROOM 45TH ANNIVERSARY GALLERY EVENT, with our new collectibles. The event will take place at the Disneyana Shop and in the Main St. Cinema, 8AM to 11AM. Then, on Saturday July 26, it's the 4th Annual LUAU NIGHT AT THE EGYPTIAN THEATER in HOLLYWOOD, presented by the American Cinematheque. The program, which will be announced practically any minute now, will include a movie, catered California-style luau dinner, Tiki-themed short subjects, live music, and a tropical vendor market. More on that soon! Wonderful illustration (I never could get the hang of gouache)...! But oy! this is not a good movie, I remember seeing it as a child, and even then I knew it kind of stunk!